It gives me great pleasure to address this gathering of eminent business representatives from India and Belarus. 2. Trade, investment and economic cooperation form one of the most important facets of contemporary India-Belarus relations. As we seek to elevate our bilateral relationship, it is our business communities that possess the maximum potential to transform and energize these ties. 3. I am delighted that a large business delegation from India is here today. They represent an array of sectors such as Energy, Consulting Services, Healthcare, Chemicals, Fertilizers, Information Technology, Infrastructure, Utilities & Renewable Energy, Manufacturing and Pharmaceuticals. I am happy to see that they are joined by many counterparts representing business and industry in Belarus. 4. 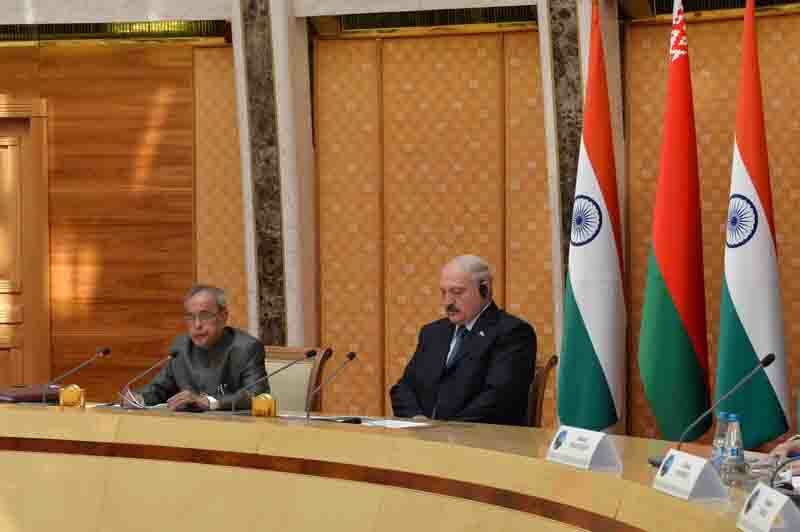 India and Belarus have a long history of friendship and multi-faceted cooperation for mutual benefit. Our political dialogue is regular and substantive. One of the significant aspects of our relationship has been the excellent understanding between our countries on international issues and support for each other in multilateral fora such as the United Nations. We have set up excellent institutional mechanisms to promote economic and trade linkages, defence cooperation as well as scientific and technological research. We have signed the necessary enabling Agreements and MOUs in a wide range of areas of shared interest and a few more have been signed during my visit. Our cultural relations and the interactions between our peoples are strong. There is wide popular support in both our countries for enhancing our relations. My visit reflects India’s deep interest in strengthening our partnership with Belarus. 5. As you are aware, India is emerging as one of the largest economies in the world and one of the fastest growing emerging markets with an average annual growth rate of more than 7 per cent over the past decade. There are positive signals that suggest that we may be moving to an even higher growth path. 6. Consolidation measures have improved our fiscal position, price levels have come down, our manufacturing sector is in a nascent stage of revival and agricultural growth has remained robust. Measures aimed at stimulating investment, both domestic and foreign, have worked in tandem with strengthening macro-economic fundamentals to kick-start the Indian economy. There is also a renewed focus on implementation of projects, especially in infrastructure. 7. I had excellent discussions with President Lukashenko yesterday. Our talks have convinced me that we share the same enthusiasm and desire to expand our bilateral relations. With a view to further energizing bilateral co-operation, we have issued a very substantive and focussed Roadmap on the India-Belarus partnership. I am sure you would have noticed that the Roadmap focuses extensively on economic, trade, investment and technology partnerships. 8. Our bilateral trade turnover is modest and way below its real potential. I am, however, optimistic- my interactions with President Lukashenko make me hopeful that we can increase our trade to a level of US $ 1 billion by the year 2020. I am confident that this level is achievable if we expand the range of items in our trade basket, increase the share of high-technology and value-added products and enhance exchanges and cooperation in the services sector, such as healthcare, IT, financial services, transport and logistics. 9. To facilitate trade, both governments are keen to intensify cooperation in quality control, quarantine, certification of goods and standardization as well as simplification of customs formalities. We will work together, bilaterally and in the context of the proposed partnership between India and the Eurasian Economic Union, to address any existing trade barriers and to avoid introduction of new barriers to trade. In this context, I am happy to announce that India has decided to grant ‘Market Economy Status’ to Belarus. This will be a significant step towards enhancing our bilateral trade and also in promoting greater integration of Belarus in international trade structures. 10. However, even as governments implement facilitating measures, greater trade can be realised only if businesses on both sides participate wholeheartedly in this process. I would like to call upon companies from India and Belarus to increase their engagement in trade fairs as well as national, international and regional exhibitions held in both countries respectively. Companies should also seek to participate more actively in international tenders of both governments, even as governmental agencies on both sides enhance information sharing to ensure that this is realised. 11. The Roadmap for India-Belarus relations clearly identifies the key sectors for our future cooperation. These include conventional and small-scale power generation, new and renewable energy, metallurgy and mining, defence, automotive and agricultural engineering, pharmaceuticals, textiles, agriculture and food processing. All these sectors offer promising opportunities for investment. Of course, this is not an exhaustive list but an indicative one, where there are immediate and promising prospects for synergy. I am also happy to inform you that India would be extending a new line of credit of US$ 100 million to Belarus to encourage joint projects in mutually identified sectors. 12. India and Belarus are committed to take all possible measures to enhance FDI in both directions, including through actively supporting commercial and investment fora such as this event. Joint ventures between India and Belarus can become even more attractive in the framework of the larger market of the Eurasian Economic Union. 13. To create the necessary enablers for greater trade and investment flows, we are seeking to enhance cooperation in the financial sector and to make available necessary financial instruments for funding of bilateral projects, financing trade and joint projects and providing export support and insurance. Wherever possible, we will work with international financial organizations in this regard. 14. As both Belarus and India are nations with a tradition of scientific and technological research, our bilateral partnership in these areas can benefit tremendously if the forces of innovation and entrepreneurship could combine with our existing strengths in research. I, therefore, urge the companies and businesses present here to explore avenues for technical cooperation in areas such as new and renewable energy, space, the chemical industry, automotive industry including special vehicles, IT, telecommunications, transport, construction and industrial infrastructure. 15. To support this, our governments need to create a favourable eco-system for attracting leading R&D institutions and universities. Both Governments need to also take measures, as may be necessary, for encouraging and inducing implementation of innovative projects, particularly in high-tech areas such as optical, laser, nano and bio-technologies, electronics and microelectronics and mechanical engineering. 16. India is happy to note that Belarus is keen to see greater participation of Indian companies engaged in nanotechnologies, bio-technologies, electronics, microelectronics and mechanical engineering in their "Great Stone” Industrial Park and the "BelBioGrad” National Scientific and Technological Park. 17. I would encourage Indian investors to consider this actively. I also call upon Belarusian companies to explore investment and scientific opportunities available in the many industrial and technology parks in India, as a means of enhancing their participation in the Indian economy. 18. I am confident that greater Business to Business interactions between India and Belarus will create greater awareness of the vast economic opportunities in the Indian economy and encourage companies from Belarus to engage with India. 19. I thank you for inviting me to share my views with you today. I also take this opportunity to wish all of you the very best in your endeavours.